I am a fan of wall art and pictures. So when Paper steps offered to send us a print of our choose I couldn’t wait to pick one. Our little boy’s room doesn’t really have a theme yet and just has a wall sticker on the opposite wall but doesn’t have much wall space anywhere else. 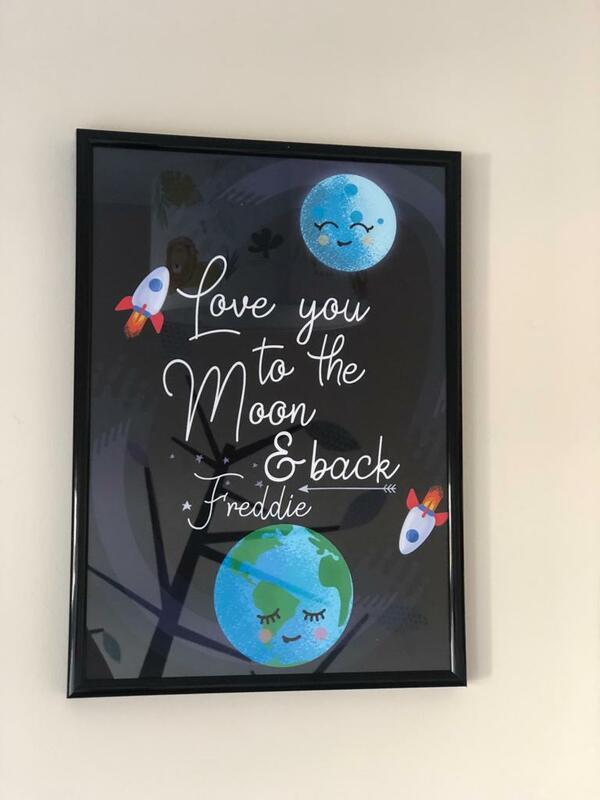 I choose the “Love you to the moon & back” which we got personalised with Freddie’s name in A4. This is priced at £10.80 and is printed on high quality matte archival paper that doesn’t fade. It has made a lovely new addition to his bedroom. There are loads of designs to choose from all which can be personalised with names free of charge. I will certainly be purchasing more prints from paper steps in the future. Ordering is so easy: Just go to https://papersteps.co.uk and pick out your favorite print, customize and then get ready to frame your pretty pic when it arrives! We were sent this print free of charge for the purpose of this review. However, all thoughts and opinions are my own. Frame not included. That looks great, I’m so pleased you liked it.